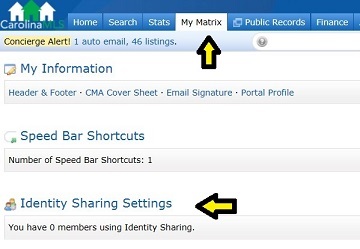 In the Matrix system, Identity Sharing is used to allow MLS users access to the accounts of other users. First, the person sharing his or her account must log into Matrix. At the top of the page, place your mouse cursor over the My Matrix tab, then click Settings in the drop-down list. On the Settings page, click "Identity Sharing Settings". If you have not yet created a team, click the link that says "Click here to Setup Identity Sharing". If a team has already been created, your currently selected team members will be listed. Click the "Add" button to select someone else. Note: An assistant in the MLS does not have the ability to Identity Share. To add a new member to the team, enter his or her MLS ID into the box on this page, and then click Find. -Have this member Impersonate me: If this option is selected, your name will appear on all work performed when the other member switches to your account. Printed reports will say “Printed by:” with your name only, and emails will say “From:” and have your name only. -Have this member Work on Behalf of me: If this option is selected, both names will appear on all work performed when the other member switches to your account. Printed reports will say “Printed by:” the other agent “on behalf of:” you, and emails will say “From:” the other agent “On behalf of:” you. Clicking "Add" will complete this process and the very next time the other user logs into Matrix, they will have the option to "Work As" you.